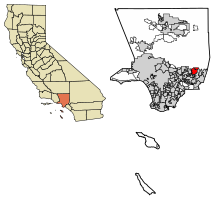 Location of Glendora in Los Angeles County, California. Known as the "Pride of the Foothills", Glendora is nestled in the foothills of the San Gabriel Mountains. Its downtown area, known as the Glendora Village, has been voted as one of the best downtowns in the San Gabriel Valley. 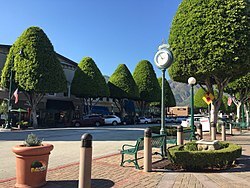 It hosts dozens of restaurants, cafes, shops and boutiques along the main street, Glendora Avenue, with many community events scheduled throughout the year. A small town vibe combined with low crime rates and a consistently high-ranking school district, has made the city an attractive choice for families in the region. Glendora celebrated its centennial as an incorporated city in 2011. Neighborhoods and residences in Glendora reflect the city's history and range from Queen Annes, to Folk Victorians, early 20th-century bungalows, to ranch style homes, to mid-rise Multi-family residential complexes, to modern mansions. 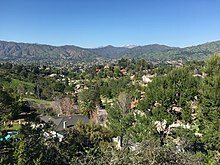 Glendora's most expensive neighborhoods contain many very large, secluded, estate homes with sweeping views across the San Gabriel Valley to Downtown Los Angeles. These neighborhoods include Morgan Ranch, Gordon Highlands, Bluebird Hill, Silent Ranch, Oak Tree Rancho, Hidden Springs, Oakhart Estates, and Easley Canyon Estates. Glendora is also home to the exclusive Glendora Country Club, which includes a Robert Trent Jones Sr. 18-hole golf course that has been played by many professional golfers. Glendora is bordered by Azusa to the west, San Dimas to the east and south, Covina and the unincorporated community of Charter Oak to the south, and the San Gabriel Mountains range to the north. Ygnacio Palomares received the 22,340-acre (90 km2) land grant Rancho San Jose from Governor Juan Bautista Alvarado in 1837. The land included the present day cities of Pomona, Claremont, La Verne, San Dimas, and Glendora. Like so many cities in the San Gabriel Valley, Glendora was established on previously remote agricultural land when the area became connected to the outside world upon the completion of the Santa Fe Railway's main transcontinental line from Los Angeles to Chicago in May 1887. 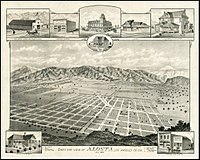 Located at the foot of the San Gabriel Mountains, Glendora was started on approximately 300 acres (120 ha) that were subdivided and sold by George D. Whitcomb in late March 1887. On the first day of sale, 300 lots were sold. Whitcomb was the founder of the Whitcomb Locomotive Works in Chicago and Rochelle, Illinois and had moved to California in the early 1880s. He devised the name Glendora by combining the name of his wife, Leadora Bennett Whitcomb, with the location of his home in a glen of the San Gabriel Mountains. In December 1907, the development of Glendora got a boost when passenger service opened on a new extension of the Pacific Electric Railway's Monrovia-Glendora line which provided service from downtown Glendora to the Pacific Electric Building at Sixth and Main in Downtown Los Angeles. Prior to its 1911 incorporation, Glendora's administrator officially occupied the office of President of Glendora. The downtown area as it appears now is the product of years of renovation and maintenance by the city. There once stood a movie theatre, various banks, and playhouses but all were converted into more modern commercial buildings. The original layout can be read about on the Downtown Glendora Historical Walk, by reading placards placed along Glendora Avenue (previously called Michigan Avenue). The original townsite was bounded by Sierra Madre Avenue on the north, Minnesota Avenue on the east, Ada Avenue and the railroad on the south, and Pennsylvania Avenue on the west. Glendora used to be home to several military academies, which have since been converted into either churches or private school facilities. These academies included Brown Military Academy, now St. Lucy's Priory High School and Church of the Open Door on Sierra Madre, and Harding Military Academy, whose property is now home to North Glendora Private, a prestigious private community adjacent to Easley Canyon atop Glendora Avenue. From 1960 to 1978, Glendora was home to Clokey Productions which produced 85 episodes of Gumby and 65 episodes of Davey and Goliath in town. In celebration of this history, Glendora hosted the first Gumby Fest in 2014 which brought thousands of people from around the country and Canada. In 2015 the 2nd GumbyFest was held at Citrus College over an entire weekend. Several wildfires have affected the city in recent years, the most notable being the Colby Fire, which displaced hundreds of Glendora residents. A relief concert titled "Glendora Band Aid" was held shortly after the fire to help raise funds to assist the homeowners who lost their homes in the fire. Glendora has an active Chamber of Commerce, established in 1903. The mission of the Glendora Chamber is to provide tools and resources to assist the business community in prospering and adapting to the economic climate, while growing membership and promoting local purchasing. Glendora is located at 34°7′51″N 117°51′15″W﻿ / ﻿34.13083°N 117.85417°W﻿ / 34.13083; -117.85417 (34.130957, -117.854127). 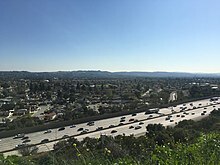 The city lies in the eastern end of the San Gabriel Valley between the San Gabriel Mountains range to the north and the South Hills to the south. 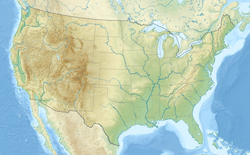 According to the United States Census Bureau, the city has a total area of 19.6 square miles (51 km2), of which 19.4 square miles (50 km2) is land and 0.2 square miles (0.52 km2), or 0.84%, is water. As of the census of 2010, there were 50,073 people, 16,819 households, and 12,866 families residing in the city. The population density was 2,581.5 inhabitants per square mile (996.8/km²). There were 17,145 housing units at an average density of 895.7 per square mile (345.9/km²). The racial makeup of the city was 75.1% White (57.0% Non-Hispanic White), 1.9% Black or African American, 0.7% Native American, 8.0% Asian, 0.1% Pacific Islander, 5.2% from other races, and 4.8% from two or more races. 30.7% of the population were Hispanic or Latino of any race. There were 16,819 households out of which 38.6% had children under the age of 18 living with them, 60.1% were married couples living together, 12.1% had a female householder with no husband present, and 23.5% were non-families. 19.1% of all households were made up of individuals and 7.9% had someone living alone who was 65 years of age or older. The average household size was 2.88 and the average family size was 3.30. In the city, the population was spread out with 27.6% under the age of 18, 7.6% from 18 to 24, 29.1% from 25 to 44, 23.2% from 45 to 64, and 12.5% who were 65 years of age or older. The median age was 37 years. For every 100 females, there were 93.2 males. For every 100 females age 18 and over, there were 89.6 males. According to the 2010 United States Census, Glendora had a median household income of $74,615, with 7.8% of the population living below the federal poverty line. More recently, the L.A. Times estimated the median household income at $81,336 based on updated figures from the U.S. Census and SCAG. Glendora is run by a city council of five members. The members are elected at large and serve four-year (staggered) terms of office. Following each election, the council selects from its membership a mayor and mayor pro tem. The current mayor is Mendell Thompson. The elections were held on a Tuesday after the first Monday in March of odd-numbered years. Starting with the 2020 election, Glendora's city council election will take place on a Tuesday after the first Monday in March, extending the council members' terms by one year. Public safety services are provided by the Glendora Police Department and the Los Angeles County Fire Department. The city's crime rate is very low. In the California State Legislature, Glendora is in the 25th Senate District, represented by Democrat Anthony Portantino, and in the 48th Assembly District, represented by Democrat Blanca Rubio. In the United States House of Representatives, Glendora is split between California's 27th congressional district (north of 210 Freeway), Cook PVI D+11, and California's 32nd congressional district (south of 210 Freeway), Cook PVI D+12, which are represented by Judy Chu (D–Monterey Park) and Grace Napolitano (D–Norwalk), respectively. The city has two public school districts: Glendora Unified and Charter Oak Unified School Districts. These school districts are considered two of the best in the state and the country, consistently ranking in the top performing brackets. Both districts have schools designated as California Distinguished Schools and Gold Ribbon Schools. Los Angeles County also offers community health services for Glendora residents at the Monrovia Health Center and Pomona Health Center. 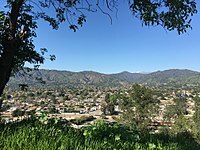 Glendora is an active community and it has an extensive system of parks, trails, and recreational programs for the community. Centennial Heritage Park - The site was constructed to depict a late 19th-century to early 20th-century citrus ranch and features the Hamilton House, the Orton Englehart workshop, a working print shop, and numerous antique farm implements. Big Tree Park - Small park with a majestic 140 years old Moreton Bay Fig tree. Lower Monroe Truck Trail - Hiking and mountain biking trail. Glendora Bougainvillea - The largest growth of Bougainvillea in the United States. Glen Oaks Golf and Learning Center - Offers a driving range, instructional services, practice area, and the 9-hole Par 3 course itself. Camp Cahuilla Summer Camp ("Dirt Camp") - One of the most popular of the Parks and Recreation programs offering activities to more than 500 children every summer. 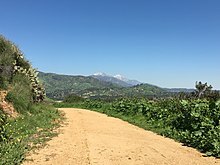 The Glendora Mountain Road and Glendora Ridge Road are also common routes for cyclists and sightseers with views through the San Gabriel Mountains. These roads have also hosted stages of the international Tour of California. Glendora is served by Foothill Transit which provides connections through the city and express service to downtown Los Angeles. The Metro Gold Line termini station at APU/Citrus College in the adjacent city of Azusa also provides a transit link to the rest of the Metro system of trains and buses. A future extension of the Gold Line, from its current termini in Azusa to the City of Montclair in San Bernardino County, will include a station in Glendora to be located in the southeast corner of the intersection of Ada Ave and Vermont St. The station is not expected to be in service until 2026. Glendora also runs its own weekday transportation shuttle service, the Glendora Mini Bus, with shuttles serving the Metrolink Commuter Rail Station in nearby Covina, the APU/Citrus College Metro station, and an inter-school service connecting some of the city's schools. The Mini Bus also provides curb-to-curb transportation services for senior and disabled residents of Glendora. Most of the Mini Bus fleet has been recently acquired by the city, and are new, modern, as well as fuel-efficient. Glendora lies at the intersection of two major freeways, the 210 and the 57. These two freeways conveniently connect the city with the rest of the Southern California region. Historic U.S. Route 66 also traverses the city from east to west and it is an important corridor for businesses. Other major roads and highways include Foothill Blvd, Grand Ave, Arrow Hwy, and Lone Hill Ave. There are no airports within the city limits. However, Glendora is within an hour drive from all major area airports including, Los Angeles International Airport (LAX), Hollywood Burbank Airport (BUR), Ontario International Airport (ONT), Long Beach Airport (LGB), and John Wayne Airport (SNA) in Orange County. KGLN TV is a Public-access channel under the exclusive editorial control of the City of Glendora. By law, programming and information appearing on this channel is limited to City-originated programming of Public Meetings, City-sponsored events/activities, City-originated information, and the California legislative network live cablecast for a portion of each program day. The San Gabriel Valley Tribune, based in Monrovia, provides mainstream news coverage for Glendora. and surrounding "Foothill cities." The Tribune carries a list of current articles as well as a history of articles concerning the City of Glendora and cities immediately surrounding the City of Glendora. Glendora Informer is a bi-monthly newsletter published and distributed by the City to all residents. It generally consists of 4 or 6 pages of information about local events planned for the year as well as details about issues involving the city such as city planning and tax issues. Of particular note is the list of up-coming guided hikes and volunteer work to maintain the city's hiking and nature trails within the Big Dalton Recreation Area and the South Hills Recreation Area. The newsletter is also published and distributed to residents on special occasions outside of its regularly-scheduled publishing dates when there are pressing issues such as water restrictions, utility rate increases or reductions, major renovation of public and private properties, and safety issues involving mud slides, fire hazards, or temporary yet long-term road closures. There is an online version of the newsletter  which focuses upon events being held at the public library, with issues going back to the year 2007. Glendora City News is a local news outlet focused on issues and events that are relevant to residents of the city of Glendora, California. Founded in November 2014, the newspaper has covered local crime, real estate, social events, and political issues, including some high-profile, highly controversial actions taken by city managers which have resulted in contentious public meetings and citywide calls for the removal of city politicians. The news outlet provides detailed information about scheduled events, public meetings, and incidents of note that occur within the city of Glendora. Of particular note for Glendora residents, the news outlet contains detailed information about ballot initiatives every time the city holds a vote, listing the ballot propositions without a discernible political bias, a stance that has earned the news outlet a moderately-large on-line subscriber base as well as 18 thousand “like” subscribers on Facebook out of a city population of 50 thousand. Consistently detailing measures on the ballot at every election has made the news source a secondary source of information, with the primary source being the City of Glendora's official web sites. The news outlet also occasionally carries information about local employment openings that have social benefit (such as environmental jobs), and routinely carries updated information about the many foothill fires and mud slides that effect residents in the northern parts of the city during the year's fire and rain seasons. Lost and found dogs and cats also get covered fairly routinely at the news outlet, with residents contacting the newspaper asking for help locating either a found pet's guardians or their missing pets. The news outlet also offers a Community Calendar series which covers up-coming events which include city meetings as well as local events created by local shops, fast food franchises, and volunteer organizations. The news outlet asks local residents to provide news tips and commentary about anything that happens in the city, including information about what city planners and managers are up to. In the past such tips have led to volunteer efforts by residents who have organized clean-up efforts of public property, such as the South Hills Dog Park where the drinking water facilities had been left in disrepair and needed cleaning. Michael Anthony – former Van Halen bassist. ^ "History of Glendora - Incorporation 1911-1950". Retrieved 2014-08-14. ^ "Glendora". Geographic Names Information System. United States Geological Survey. Retrieved October 10, 2014. ^ "Glendora (city) QuickFacts". United States Census Bureau. Retrieved February 19, 2015. ^ "USPS – ZIP Code Lookup – Find a ZIP+ 4 Code By City Results". Retrieved 2007-01-19. ^ "Number Administration System – NPA and City/Town Search Results". Archived from the original on September 26, 2007. Retrieved January 19, 2007. ^ "San Gabriel Valley's Best". Archived from the original on February 26, 2017. Retrieved February 25, 2017. ^ Guinn, James Miller (1907). A History of California and an Extended History of Its Southern Coast Counties: Also Containing Biographies of Well-known Citizens of the Past and Present, Volume 1. Los Angeles, California: Historic Record Company. p. 392. Retrieved 4 December 2017. ^ "Brown Military Academy - John Brown University". brownmilitaryacademy.com. ^ "July 6, 1972: Harding Military Academy Closes its Doors". Glendora, California Patch. 2011-07-06. ^ "Gumby's Studio, Clokey Productions". ^ "Gumby Fest 2015: Citrus College, Glendora, CA USA". gumbyfest.net. ^ "Glendora Chamber of Commerce". glendora-chamber.org. ^ "Glendora Chamber of Commerce". Retrieved March 24, 2015. ^ "Average Weather for - Temperature and Precipitation". weather.com. Retrieved 2014-05-03. ^ a b "Glendora (city) QuickFacts from the US Census Bureau". census.gov. Archived from the original on February 20, 2015. Retrieved February 20, 2015. ^ "Statewide Database". UC Regents. Retrieved November 28, 2014. ^ "Glendora Redistricting". glendora.patch.com. Retrieved July 25, 2011. ^ "Distinguished School Awards". ca.gov. ^ "Foothill Christian School". foothillchristian.org. ^ "Glendora". San Gabriel Valley Tribune. 2013-06-29. Retrieved 27 February 2017. ^ "Glendora News: San Gabriel Valley Tribune". Retrieved 12 October 2018. ^ "Newsletter, City of Glendora". Retrieved 12 October 2018. ^ "South Hills Park | City of Glendora". ^ a b "Glendora Public Library: Weblinks Collection – Community Information". Archived from the original on May 31, 2008. Retrieved 2008-09-06. 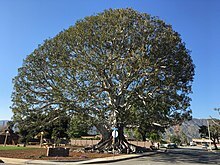 Wikimedia Commons has media related to Glendora, California. Howser, Huell (November 8, 2010). "Rainbird – California's Gold (12002)". California's Gold. Chapman University Huell Howser Archive.